Borussia Dortmund will not sell Jadon Sancho before next season, sporting director Michael Zorc has insisted. 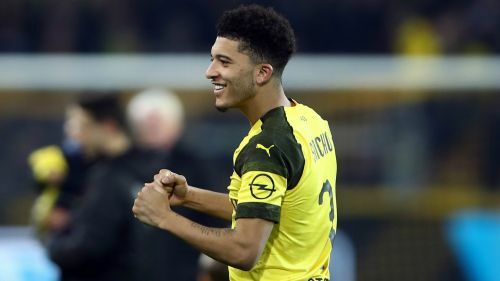 England international Sancho has enjoyed a stunning season at Signal Iduna Park, with eight goals and 10 assists in 25 Bundesliga appearances. The 18-year-old's form has seen him linked with Paris Saint-Germain and Manchester United, who are reportedly considering a bid of up to £100million to bring him back to the Premier League. However, Zorc says the former Manchester City youngster will not be going anywhere. "I'm far from putting a price tag on Jadon, but I would say that, even for the biggest club in the world, it would be hard to get his transfer through right now," he told Sport Bild. "Jadon will play at Dortmund next season. We're definitely planning with him." Zorc also intends to open contract talks with midfielder Mario Gotze, whose deal expires at the end of next season. Gotze has established himself as an important member of Lucien Favre's squad, having battled back to full fitness following a metabolic issue. "We'll find the right time to talk to him about it," Zorc said of a possible Gotze extension. "His development this season has been really good. Mario was handicapped for a long time due to his metabolic problems and we gave him the time to come back."